The organisers of the All Youths Tush Awards, TDA Multimedia, which is one of Nigeria’s most consistent and popular all youths awards platform has announced the unveiling of the categories for this year’s edition of the programme which has been scheduled to hold much later in the year. This is coming days after the end of the #SuggestTushCategory campaign which saw members of the public suggesting categories that they would want to be added to the award. At the end of the exercise,14 Student Categories were formed, 18 Youth/Celebrity Categories and 3 Role Model Awards to make a total of 35 Award Categories in all. In the Press Release signed by the Director of Media Communications and PR for the platform, Mr Tofarati Ige, he also informed that the call for nominations start officially Wednessday August 12 2015 and this will run till August 31, 2015. 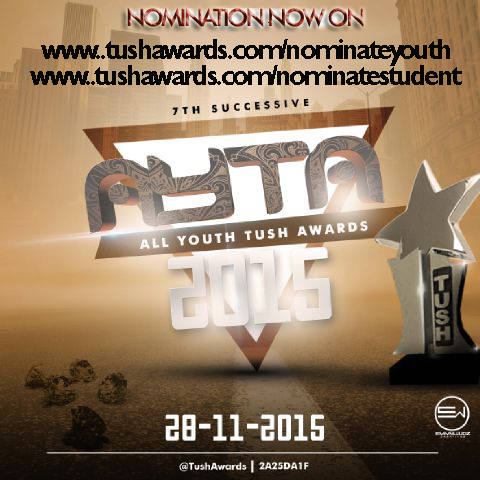 Nominations for the 7th successive edition of the All Youths Tush Awards (AYTA) has commenced. The categories for nominations have been divided into two major parts: Students and Youths. Examples of awards in the youths section are: Best Youth Act ( Music), Best Youth Act (Movie), Best Youth Act (Comedy), On Air Personality, Youth Magazine of the Year, Youth Entrepreneur of the Year, Youth Achiever of the Year amongst others, while the Students' section has awards such as Most Beautiful, Most Popular Male, Student of the Year, Most Enterprising Student, Big Bold and Beautiful, and many others. You can nominate as many times as you wish. A person will be considered as a nominee even if his name is only nominated once. Past winners of AYTA include Seyi Law, Damola Olatunji, Korede Bello, Sean Tizzle, Seyi Shay, DJ Real, Zainab Balogun, Gabriel Afolayan, Dj Neptune amongst others.